Catherine Murphy's sweet garden stake brings an enchanted touch to your flower bed. Busy bees are usually seen zipping around, pollinating your garden's flowers. This one prefers to hang out in one place, displaying his ornate beauty. Catherine Murphy handcrafts the artful (yet adorable) design from copper, twisting a playful spiral for his body and adding wings with a rich patina gradient. 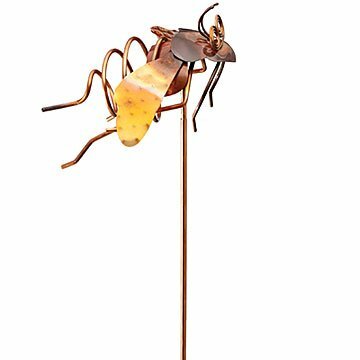 A stunning addition to your yard, the winged friend also makes a lovely gift for nature lovers or gardener friends who appreciate a bee"s soft buzz. Handmade in Asheville, North Carolina.